SINGAPORE - Business sentiments among local companies remained upbeat despite easing for the final quarter of 2017, according to the latest survey by the Singapore Commercial Credit Bureau (SCCB) released on Monday (Sept 11). 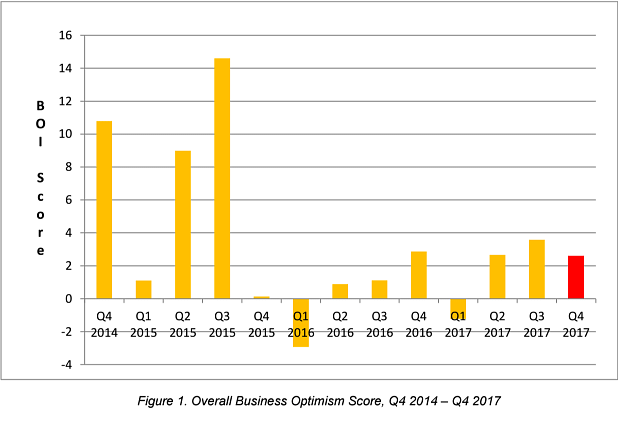 Its Business Optimism Index (BOI) dropped to +2.60 percentage points for the final three months of this year from +3.58 percentage points for the previous quarter. On a year-on-year basis, the BOI dipped from +2.87 percentage points for the fourth quarter of 2016. The manufacturing, services and wholesale sectors emerged as the most optimistic sectors with four indicators in the expansionary region. But construction firms remained pessimistic, owing to prolonged deterioration in both private and public sector building activities. The transport sector meanwhile was mildly upbeat, mainly due to growth within the water transport segment. "Although business sentiments have dipped slightly for Q4 2017, strong sequential growth in the manufacturing segment and a recovery of export markets around the region has led businesses to maintain positive for the final quarter of 2017," said Ms Audrey Chia, SCCB's chief executive officer. "We expect that the overall outlook will remain stable for the rest of 2017 given that Singapore's economy will continue to be supported by robust public finances and the government's fiscal buffers to further diversify the country's economic base and keep negative shocks at bay in the near-term," she added.